Recently, a friend and wise man asked me to be a part of an incredible project he’s putting together. It involves anti-racism work, which is at my heart, and writing . . . and it would bring me into new circles with new connections. But it wasn’t the right time for me to take on the project, and so I had to say no. I spent 24 hours twisting and turning in my mind to try and figure out how I could do it. I had been committed to the project, had even begun work. But when I woke at 1:30am and simply knew I had to talk with him about compensation, compensation that I expected wasn’t there, I knew I had to turn it down. I’m very sad about that today, but I feel peace, too. Early in my writing career, I say Yes, to almost everything . . . writing social media posts for a portable toilet company, doing web copy for a “pole dancing as self-esteem building” company, managing website design projects, writing guest blogs everywhere. I was building my credentials and my chops, and I didn’t have the option to turn down even small amounts of income when they came. But now, 6 years in with a flourishing editing business, with 6 books in the world, with a publisher considering a new book and 2 of my own self-published books forthcoming in the next 6 months or so, now I’m at a place where I have to decide when to say No. I don’t like to say No because I’m a people pleaser, a Type 2 on the Enneagram, if you’re familiar. I don’t like to disappoint people. I have earned the right to say No, and I know that. I’ve paid my dues. I’ve shown my value. I can say No. . . my next growth step is to learn how to do so without guilt. I’m working on that. Does this align with how I want to be a writer in the world? Do the content, the venue, the partners, and the advertising speak to something I care about enough to give my time, energy, and words to it? Does the project pay – preferably in dollars but also in connections? If so, does it pay enough for me to take time away from other work to make it worthwhile? How much time is involved? Is this something I could write in an hour one afternoon between client calls, or will this project take 6 months of work and require a significant and ongoing commitment? My answers to those questions determine whether or not I take on a project – anything from ghostwriting a book (as the project I just turned down was) to writing a guest blog for someone to mentoring writers as part of a new program for a friend. If my answer to the first question is No, then it’s easy – I don’t do it. But if it’s Yes, then my decision becomes more complicated. Value yourself and your writing. Think about your writing goals long-term and your capacity short term. Give yourself only to those projects that fulfill you and help you support the life you are called to live. Any project that doesn’t take account of your value, your skill, your time, your talent, and your calling isn’t the right project for you. But only you can decide which projects are right for you. The good news of this situation is that a friend of mine is looking for work of this nature, and so I was able to recommend her for the work. It may be a better fit for her life at this moment than it is for mine, and that is a true gift, hopefully for all of us. 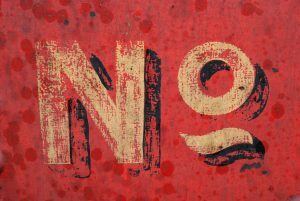 Saying No to activities that keep us from our work is hard, and so is saying No when work that isn’t right for you. But saying No is a big part of living the writing life. . . we simply have to trust ourselves with that word just as we trust our words to come when we give them space.